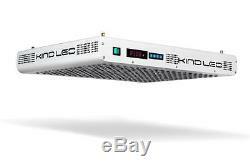 Authorized Reseller of Kind LED Grow Lights the World's Best LED Grow Light Fixtures. 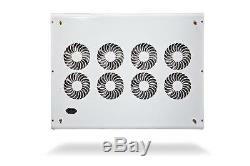 Pack of 4 XL1000 Kind LED Grow Lights. (Unless otherwise stated as an open-box item) The K5 Series is comprised of the perfect mix of 3 5 Watt Light Emitting Diodes. Each of the three primary ranges of the photosynthetic spectrum can be dimmed and intensified individually to give your plants their ideal spectral ratios from seed straight through to harvest. The K5 Series boasts an extra large footprint that dwarfs those of competing LEDs and now even equals that of traditional grow lighting. The Secondary Optical Lenses individually focus and intensify the output of every single diode, significantly magnifying PAR and increasing canopy penetration. This revolutionary series of LED grow lights will produce the biggest and best yields, while consuming approximately half the electricity and producing a fraction of the heat of HID lighting. Your Kind K5 will cultivate record breaking yields, both in quantity and quality, while running quieter, cooler, and more efficiently than any other grow light. This is why growers are unanimously agreeing that the new K5 Series LED Grow Lights are clearly THE best LED grow light fixtures. A Little Kindness Goes A Long Way. KINDEST YIELDS - Perfect Mix of 3 and 5 Watt Diodes Increases Overall Efficiency and Intensity, Resulting in Huge Yields KINDEST DIMMABLE SPECTRUM - Full Spectrum Control Allows Digital Tuning of Spectrum to Match Any Plant Type at Any Stage of Growth, Veg or Flower KINDEST FOOTPRINT - Largest Footprint of Any LED in the Industry, Now Matching That of its HPS Counterpart KINDEST INTENSITY -Secondary Optical Lens Magnifies PAR and Increases Canopy Penetration By Up to 200%. Why the Kind K5 is the Best LED Grow Light. Uses a proprietary 12 bandwidth spectrum that covers the entire photosynthetic growing spectrum (visible and invisible), designed to maximize fruit, flower, and oil production. Utilizes a thick, heavy duty 2 CM aluminum heat sinks that dissipate heat much more effectively than other LED lights, making Kind LED grow lights run more smoothly throughout many, many harvests. Features an extra large footprint which produces 33% - 100% more output on the periphery, as well as evenly covering more area per watt than any other LED grow light. Kind LED Exclusive "Mother Earth" timing function allows user to mimic an ideal day in the great outdoors by slowly waking plants at sunrise, providing peak intensity for the perfect length of time throughout the day, and tucking them in at sunset with slow dimming diodes. 8 timing stages for each of the three primary ranges of the photosynthetic spectrum, offer complete customization to suit any grower's desired duration and intensity. 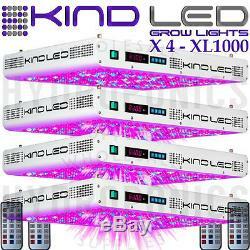 Why are the Kind K5 series XL1000's the Best LED Grow Light Fixtures? Extra Large footprint solves one of the main problems that LED lights have faced in the past. Because of historically small footprints, due to small circuit board construction, LED lights have always failed to deliver the finished harvest weights promised in comparison to their said HPS counterparts. Truly lit square footage of canopy space is a very crucial component to overall harvest weight. Kind LED features high quality diodes intensified with secondary optical lenses and spread over an extra large housing, now providing true footprint replacements for 750w and 1000w HPS. Finally, with Kind LED, harvest weights are true to spec. Fully customizable spectrum allows the user to not only adjust the spectrum to match vegetative and flowering stages of their plants, but also allows for specific spectrum control for nearly any type of plant genus in applications such as greenhouse growing and in agriculture operations where crop rotation, or crop zoning, is common. Internal timing function of the K5 series lights allows for more streamline setups where the user can do away with separate analog or digital timers that can be bulky and extremely unreliable. Now, all light cycles are programmed and changed from a convenient remote. 8 stage'mother earth' timing function allows user to mimic the great outdoors like never before seen in indoor growing, slowly waking your plants up in the morning and seeing them to bed every night. 8 separately set stages allow for light to gently turn on in the'morning' (sunrise), intensify into full power (full day sun), then gently turn off in the'evening' (sunset). Each of these stages can be set to the user's desired duration and desired spectrum intensities. Perfect mix of 3 watt and 5 watt diodes create the ideal amount of usable light for lush, healthy, huge plants. 5 watt LED diodes are awesome. They emit an intense amount of light and have the ability to penetrate the plants canopy like no other. 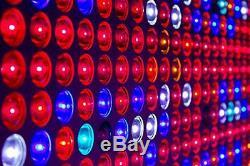 But, too many 5 watt LED chips, and a light can run too hot, doing away with one of the main benefits of LED lights. The K5 series lights have the best of both worlds. 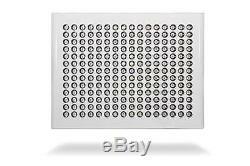 The'sweet spot' efficiency of the 3 watt LED chips, mixed with the harvest boosting power of the 5 watt LED chips. True to spec harvest expectations. When we say our XL1000 replaces a 1000 HPS, we mean it. In order to be a reputable company, one must not make false claims that their product can't support. Let's face it, no LED light that only draws 350 watts is going to replace a 1000 watt HPS, period. We make reasonable claims at KIND LED. We have found, through extensive testing and research, that a 40-50% savings in electricity is what you can expect from our lights. Our 1000 watt equivalent light draws about 630 watts or 63% of what a 1000 watt HPS would typically pull. But that's just the light!! Add up all the other savings in equipment needed for heat management in a traditional HPS room, and the energy savings are even more remarkable. All functions of the K5 series are run from a convenient remote. We here at KIND LED are still scratching our heads as to how most LED companies think people are able to flip an analog switch or knob to control spectrum or switch between modes on their lights when they are in the middle of a grow and their light(s) are hanging above a huge canopy of delicate plants. Kind LED lights are fully controlled from a convenient handheld remote. Control 1 or 100 simultaneously from one small device. Kind LED lights use PWM (Pulse Width Modulation) dimming. Some lights use archaic methods of dimming that only lessen the brightness of the light being emitted, while still pulling the same amount of energy out of the wall. PWM dimming allows the light to only consume as much power as it needs to drive the diodes at their set level of brightness. Man, there are some ugly LED lights out there. Function over fashion is a must in lighting, but we have both. These Kind LED grow lights use only about half the electricity as HPS lights, and produce much more yield per watt. Many studies have even show an increase in oil production and quality, closer inter-nodal spacing, and denser fruits and flowers. Also, because these Kind LED grow lights produce less heat, they do not need to be air-cooled like HPS lights, therefore eliminating the need for additional fans, which also makes them run quieter. Kind LED lights run cool, so cool in fact that no additional temperature control equipment is needed besides the internal circulation fans. Lower light temperatures lead to a much more easily maintained ideal grow environment in which your plants would thrive. Because the individual diodes of a Kind LED light are set to a specific color and in a specific proportion, we are able to emit the exact spectrum that a developing plant would need to thrive, with little to no waste. The 12 band complete spectrum is designed to perfectly match the growth needs of your plants. Kind LED Growers will be able to simplify their grow rooms, save on electrical consumption, keep their rooms cooler, and perhaps most importantly, experience a marked increase in the quality of their fruits, flowers, and vegetables. 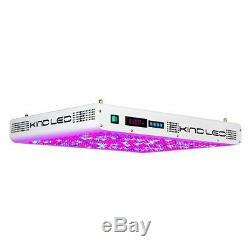 Kind LED Grow Light Bulbs vs. K5 Kind LED lights will match or outperform any other similar 5 watt setup that is seen often throughout the web, regardless of price or claims. Kind LED Grow Lights are truly one of a KIND. A single Kind K5 Series LED Grow Light Eliminates the need for ALL of the following. Costly Metal Halide (MH) Vegetation Lighting. Heat Producing High Pressure Sodium (HPS) Flowering Lighting. Noisy Inline Fans Used to Cool Traditional "Hot Running" HID Lighting. Air Conditioning to Bring Down Excessive Heat. 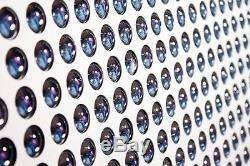 Water Chillers to Cool Down Boiling Reservoir Temperatures. Will arrive in plain brown or white box with no labels. Packing slip has no mention of growing or hydroponics. 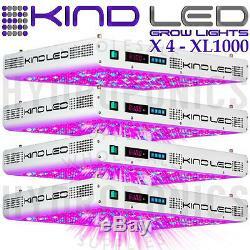 The item "Kind LED Grow Lights K5 XL1000 Bundle of 4 Lights! Limited Time Offer Buy Now" is in sale since Friday, August 05, 2016. This item is in the category "Home & Garden\Yard, Garden & Outdoor Living\Gardening Supplies\Hydroponics & Seed Starting\Grow Light Kits". 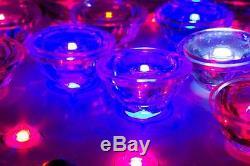 The seller is "wholesalehydroponicssupplies" and is located in Tucson, Arizona. This item can be shipped worldwide.